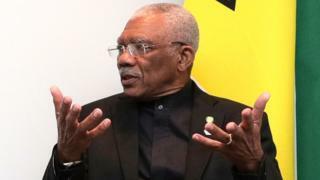 Image caption President Granger said the deadly pirate attacks had "come as a great setback"
Guyana's President David Granger has described as a "massacre" a pirate attack last week that is feared to have killed at least a dozen fishermen. "It is a great massacre, a great tragedy," Mr Granger said on Thursday. Four boats carrying some 20 people were attacked off the coast of neighbouring Suriname in South America last Friday, local authorities said. The bodies of three men have since been found. Four others were said to have escaped, Reuters news agency reported. Some of the fishermen who remain missing were forced into the sea with weights tied to their legs, according to reports from the survivors. The men, most of them Guyanese, were beaten and robbed. Mr Granger told reporters on Thursday that Guyana had been "very successful" in curbing piracy in the region but that the latest deadly attacks had "come as a great setback". "We extend sympathy to the families of the bereaved," he added. Search and rescue teams are continuing operations in the region, with Surinamese and Guyanese authorities working together, Mr Granger said. The families of the victims were told that they would be supported by the government. Piracy has long been an issue in the waters off Suriname and Guyana, although the number of incidents reported has reduced in recent years.